Photograph: Courtesy Au Cheval Au Cheval serves fries topped with mornay sauce and a fried egg. 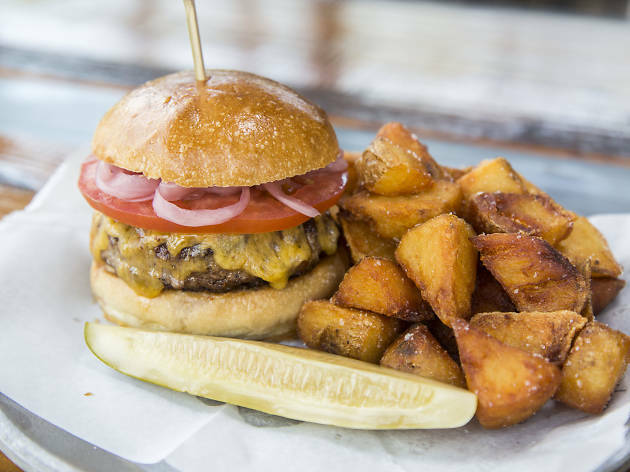 It's no surprise Chicago restaurants absolutely nail french fries, considering how great Chicago is at making hot dogs and burgers. These versions of our favorite side range from garlic fries at a Latin American restaurant to decadent foie gras fries, and they are totally worth seeking out. It’s hard to beat the Belgians at their fry game. 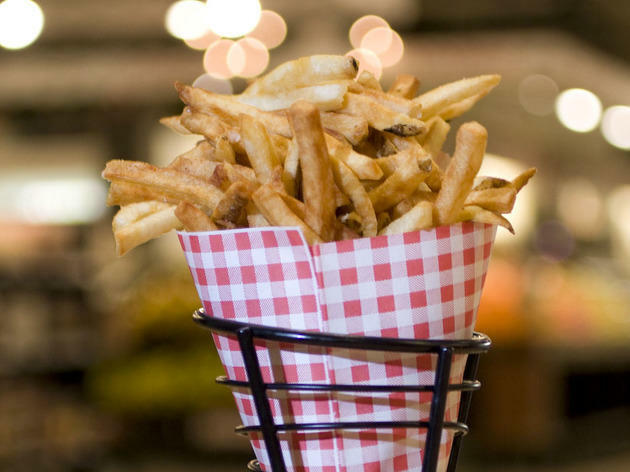 Head to the back of the French Market and cozy up at one of the indoor patio tables any time of the year to enjoy these magnificent fries. 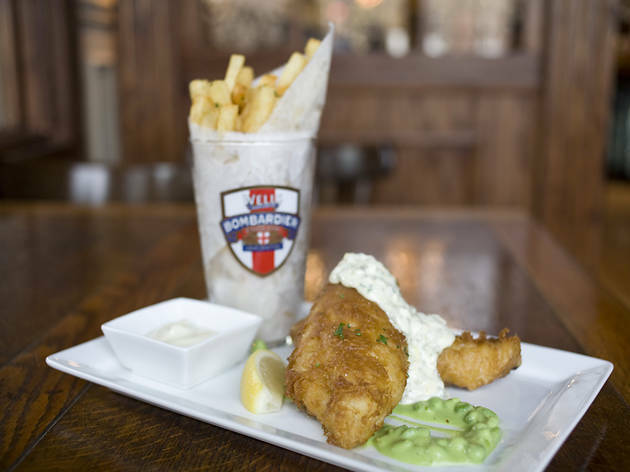 Served in a traditional paper cone, they’re the best in the city. 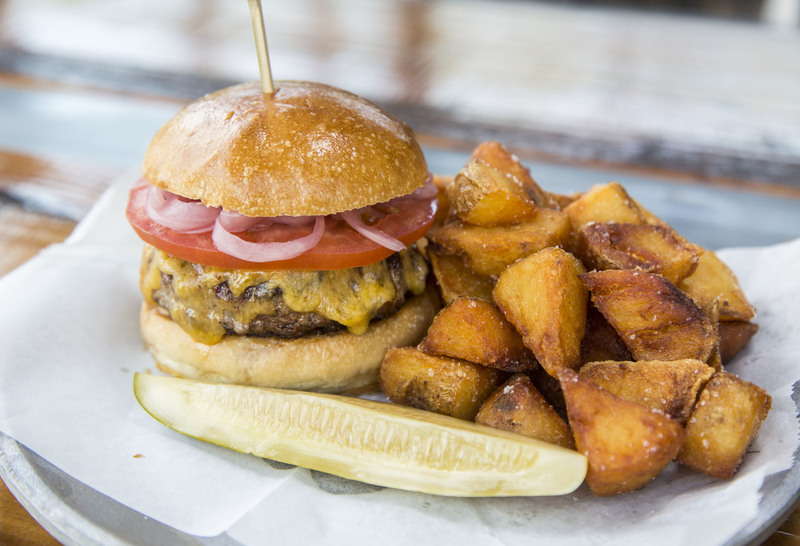 Hand-cut and cooked to order, they’re perfectly salted and crisp. With more than a dozen flavors of dipping sauces, you can choose the perfect one for you—we’re partial to the spicy-sweet harissa aioli, which has a subtle smokiness and peppery heat, or the more classic truffle aioli, which has a luxuriously deep flavor. 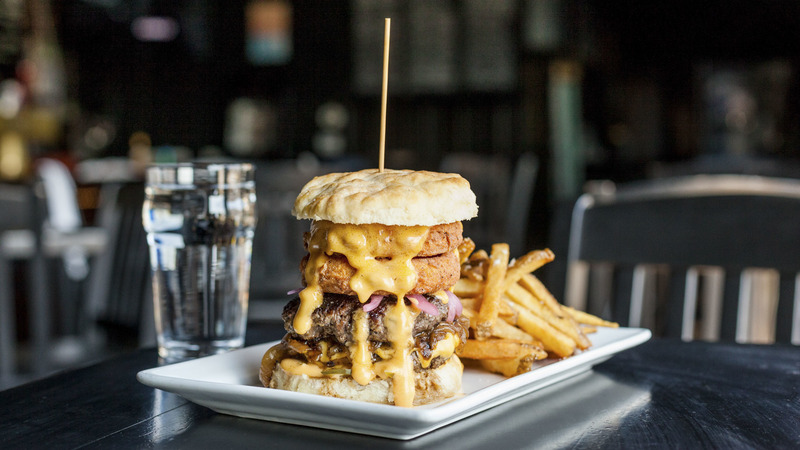 The burger at Au Cheval has been lauded nationwide, but that doesn’t mean you should ignore the other items on the menu. 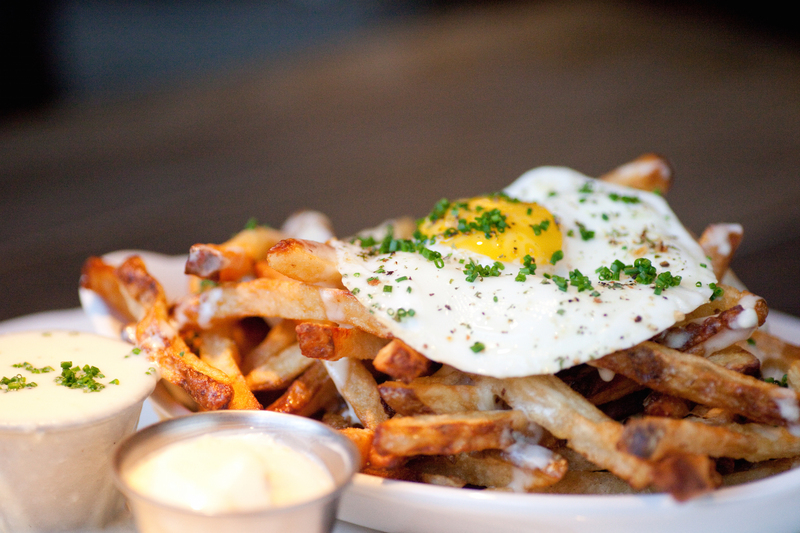 Under the “Eggs” section of the brunch menu lies one of the best fry dishes in the city. The golden pile of rich and crispy potatoes comes drizzled with a creamy mornay sauce, which has a deep tang of real aged cheddar. Mix the sauce with the runny, barely cooked yolk of the fried egg perched on top to turn these into your dream breakfast dish, any time of the day. 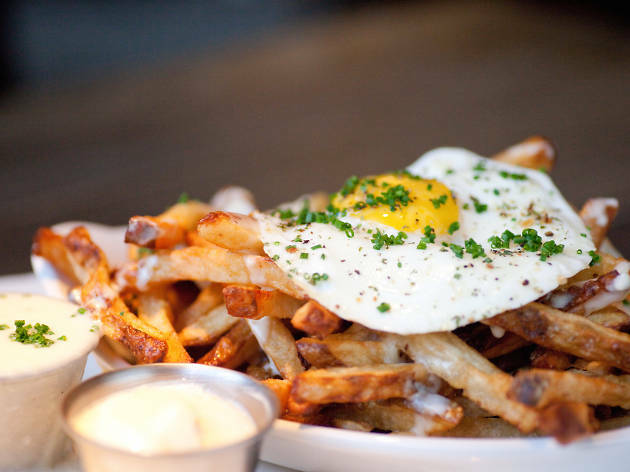 If the cheese sauce, twice-fried-in-lard taters and egg aren’t sumptuous enough, the fries also come with a side of creamy, garlicky aioli, making these fries unapologetically heavy and not for the faint of heart. 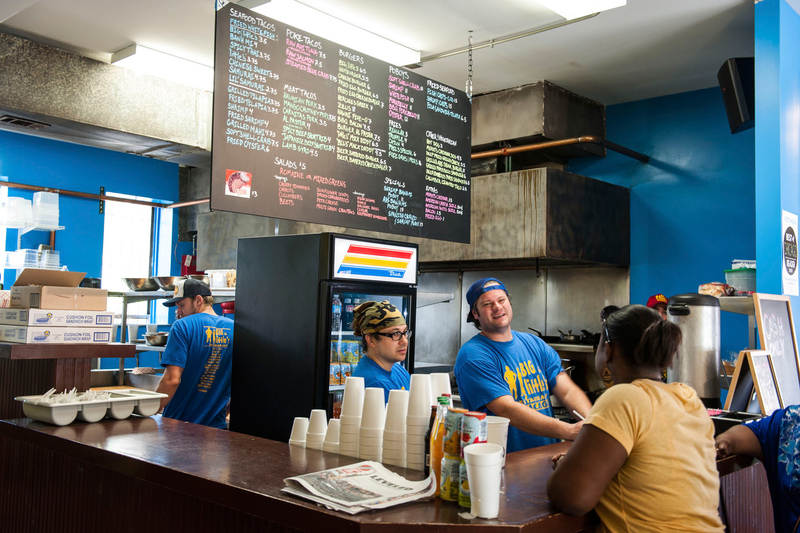 The Royal Pie bakers of Chicago aren't a one-trick pony. 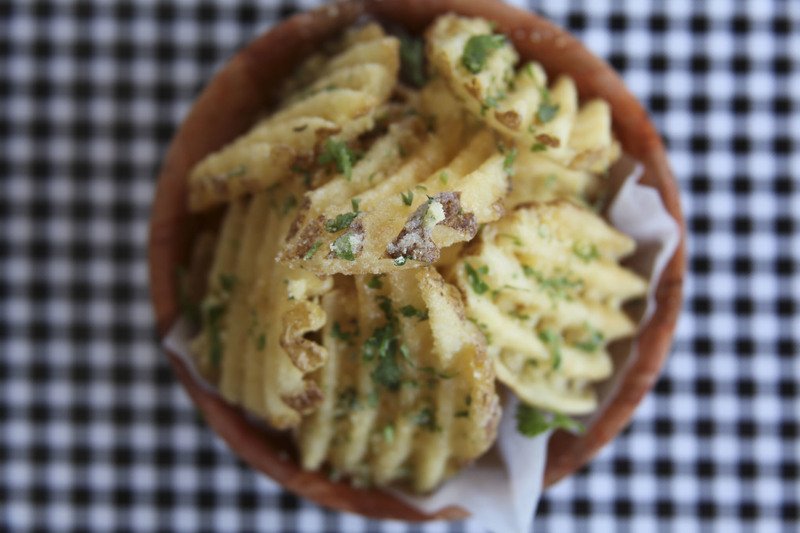 Pleasant House Pub churns out fantastic fries—well, chips. They're chunks of potatoes that are perfectly cooked and then fried to perfection. They're crisp on the outside, salty and a bit greasy. Pair them with your pick of pie (we're fans of the kale and mushroom or the steak and ale) or any of the other dishes and a tall glass of beer and you'll be set. 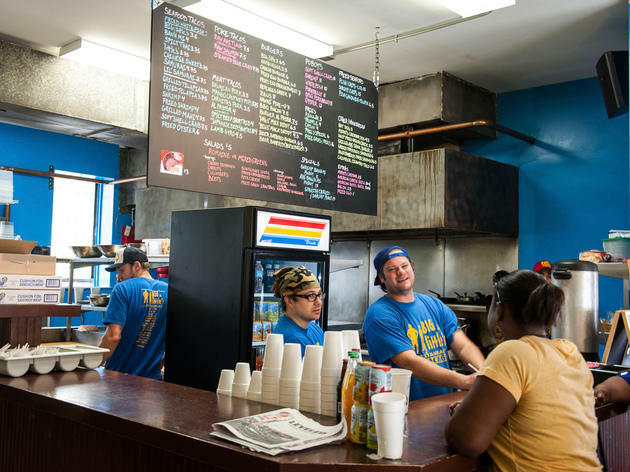 Not since the weekend duck fat fries at now-shuttered Hot Doug’s has Chicago seen the kind of excessive french fry madness that you can order at burger joint Big & Little’s. Here the fries are marvelous—made with hand-cut potatoes, dunked in hot oil until they’re crispy golden brown, then heavily seasoned. 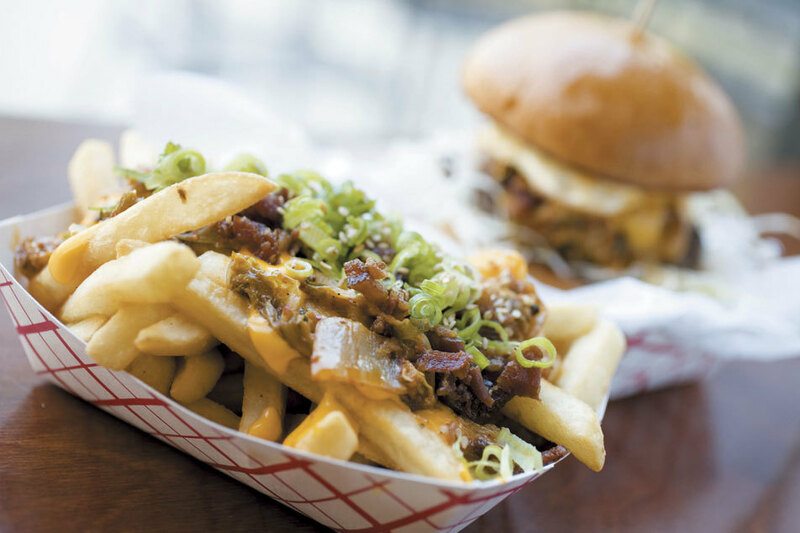 When topped with large seared lobes of foie gras and the warm, melty fat that goes along with it, these fries are next level. If there’s something more indulgent and delicious than fries smothered in rich, creamy foie gras, we don’t know what it is. 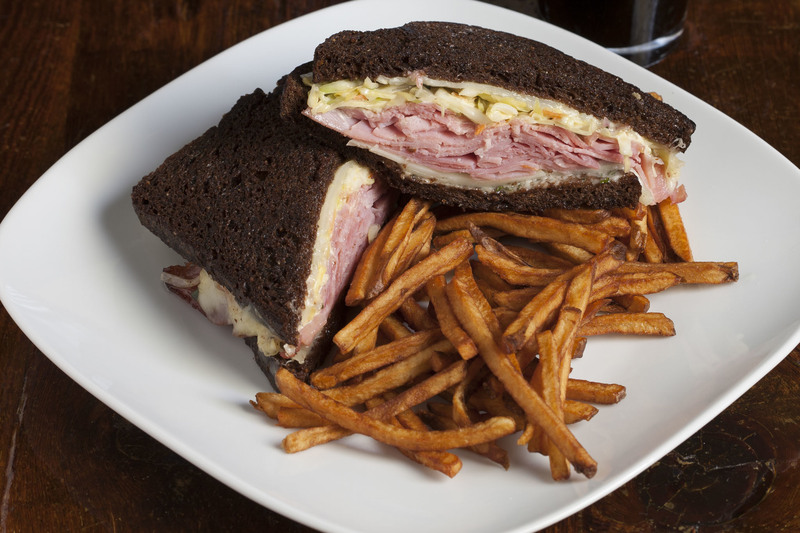 Andersonville mainstay Hopleaf has more than just a great selection of domestic and imported craft beer. While you might be wooed by a menu of freshly steamed mussels or plump sausages with grainy, spicy mustards, don’t miss the iconic frites. 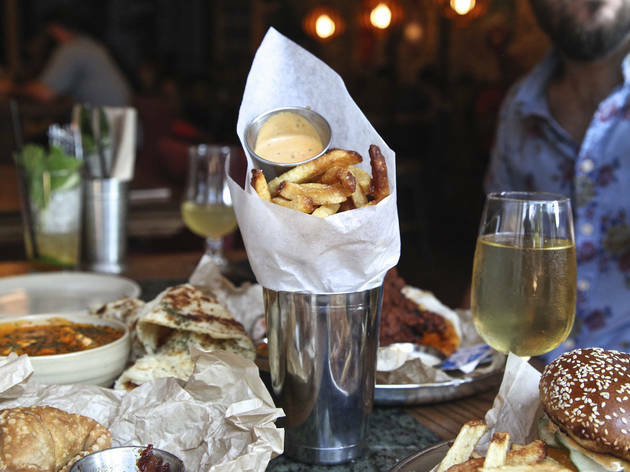 The thin, matchstick-style fries arrive at the table cozied in a paper cone and are served with garlic aioli. You can dunk them in mustard or the murky depths of your mussels, but they make a perfectly delightful bar snack on their own. The garlic aioli is so garlicky you'll still taste it the next day. 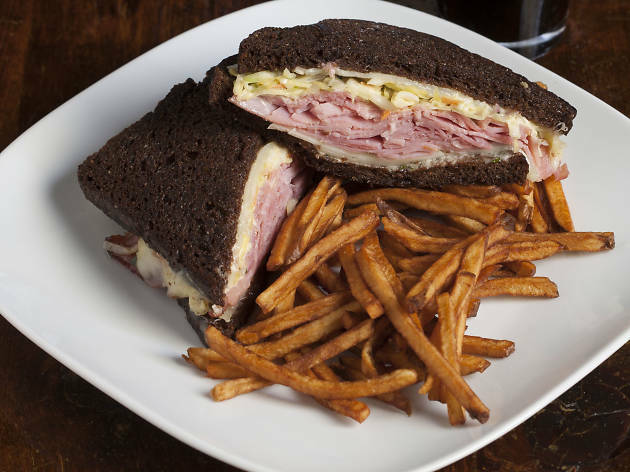 This Logan Square pub dishes out British classics like bubble and squeak, as well as a decidedly British take on french fries. 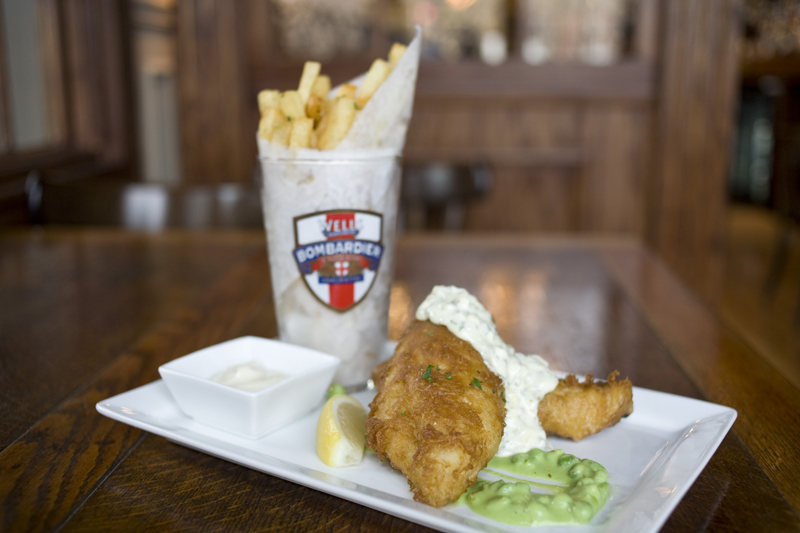 The Owen & Engine fries are salt and malty vinegar British pub chips and are available as a side or with the fish and chips. These have more heft than a typical American fry, and the zippy malt aioli will take care of all your salt and vinegar cravings. Add a few shakes of malt vinegar along with the aioli for a bracingly tangy and creamy combination. Kimchi might be one of the best ways to make fries better (if it's even possible, fries might be one of the best things in the world). 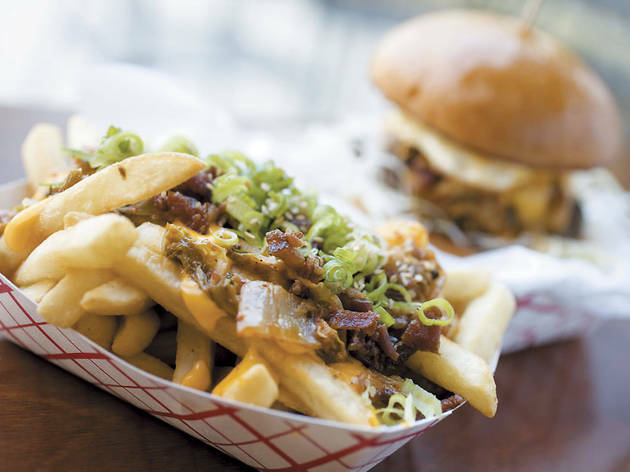 BopNGrill tops its kimchi fries with caramelized kimchi that's cooked in rendered pork fat (drool), cheese sauce, bacon, scallions and sesame seeds. These slices of potato might just send us to heaven. 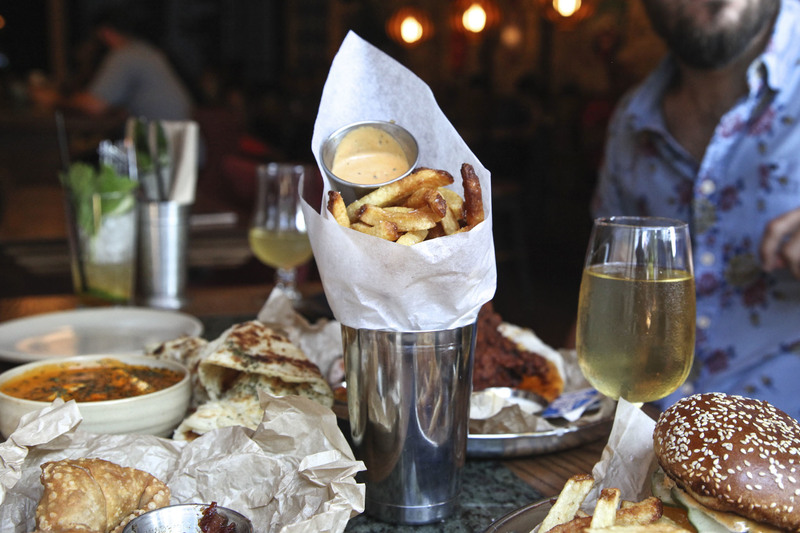 The British-Indian spot serves up excellent Indian food, from spot-on crispy samosas to boozy mango lassis. 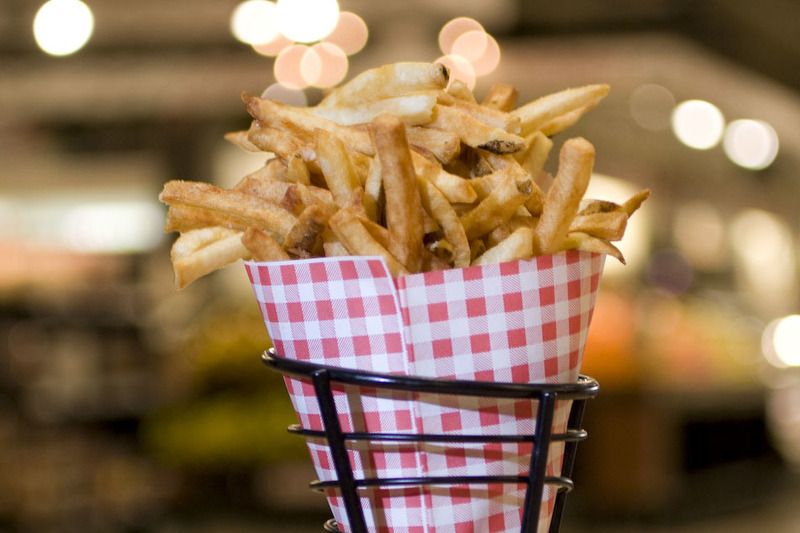 But that doesn’t mean you should overlook menu items that might sound rather humdrum on paper, like the superlative cone of crispy brown pub-style fries. You’ll find yourself scraping every last bit of the creamy, slightly spicy and smoky aioli from the bottom of the condiment cup. 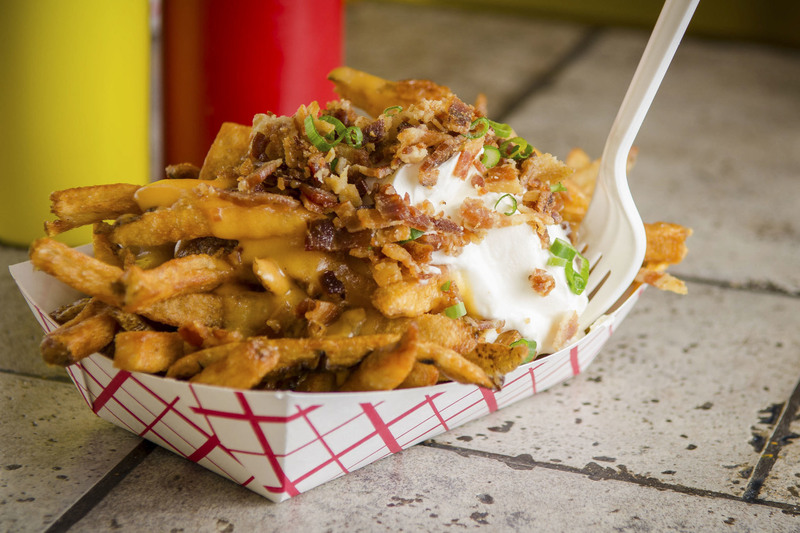 The fries themselves are more than just a vehicle for consuming said sauce, and the crunchy fried exterior—salted just so—gives way to a fluffy potato middle. Try to pace yourself—if you fill up on fries you won’t have room for chai dulce de leche doughnuts for dessert. 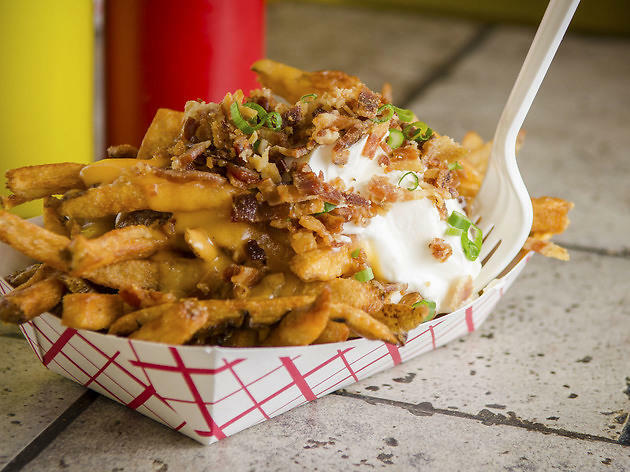 One taste of the indulgent loaded fries at Edzo’s in Evanston, and you’ll wonder why you were ever so silly to put ketchup on your fries in the first place. 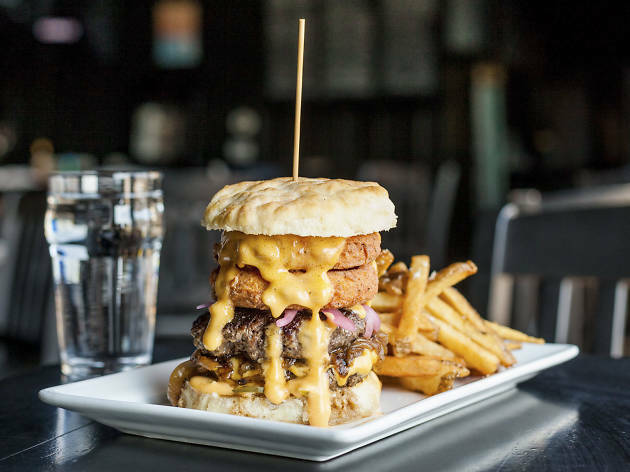 The bright golden-brown treat is smothered in toppings, from a sharp and creamy sauce made with real cheddar cheese to a huge dollop of smooth and tangy sour cream. Crumbles of salty, greasy bacon help cut through the creaminess. The tiny pop of green from the scallions sprinkled over the top seems almost like a last-minute apology for the luxury of the dish. 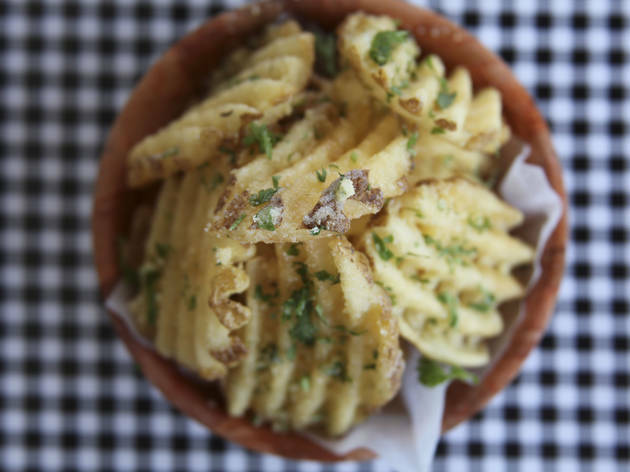 As a whole, these fries are as much gluttony as you can possibly fit in a paper bowl. Go ahead and try to read through this enitre list without salivating.